Since becoming pope, Francis has asked the Church repeatedly to reach outward toward the peripheries, and he immediately began to show his preference for them. His first papal trip was to the Italian island of Lampedusa, a periphery of the Mediterranean and an asylum for refugees. His first European trip outside Italy was to Albania, a country that is still not a member of the European Union. And the big reform of the Church seems to be oriented to giving more weight and power to the peripheries of the Church. But which are the peripheries that Pope Francis prefers? 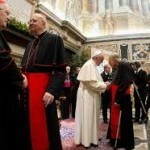 To which peripheries does the Pope want to give the keys of the Church? This question occurs as Pope Francis is leaving on his trip to Asia (another periphery), because his plan for the Church may be better understood by understanding which are his preferred peripheries. Pope Francis’ choices of new Cardinals for the next Consistory have surprised many. In general, he respected some non-written rules for the creation of new Cardinals; yet he interpreted these rules his own way, mixing up the cards as he usually does. In the end, his picks not only tilted the balance of influence in the College toward the Church’s peripheries, more importantly, they showed that some peripheries are more significant than others. Among the new picks, there are only two African bishops who will be able to vote in a conclave, from Ethiopia and Cape Verde. No new Cardinals hail from North America. Just four come from Europe. In general, all the new Cardinals come from peripheral countries. They are characterized by a strong pastoral commitment, especially on social issues. And most of them do not get along well with the Church’s central governing institution, or at least they do not know it very well. Some of them are anti-Roman, or at least they see Rome as an impediment for their pastoral activity. An exception is number two on the papal list, Manuel Macario do Nascimento Clemente, Patriarch of Lisbon. He is not a progressive, but a scholar, a pretty conservative one. Nevertheless, Patriarch Clemente was able to set the bar for his church in tune with Pope Francis, for example, by organizing a missionary synod for 2016 and by positioning himself in the mainstream during the last synod of bishops. Even if deemed a traditionalist, he knows which way the wind is blowing. An 18th-century agreement between Pope Clement XI and King John V of Portugal requires that the Patriarch of Lisbon be created Cardinal at the first consistory that occurs after his appointment. Patriarch Clemente had to wait an additional consistory before making the cut. This may not have been just by chance. Among the most anti-Roman peripheries is New Zealand. At a first sight, the choice of Archbishop John Atcherley Dew seemed to be a tribute to Cardinal George Pell, in an effort to give the College of Cardinals a new residential representative from Oceania, since Pell’s successor in Sydney was not going to receive a red hat. This interpretation was tempting, but it proved wrong. New Zealand is one of the most secularized countries in the world, and the Catholic Church there has drifted toward desacralization. New Zealand is the “Holland of Oceania”. The last liturgical reform there dropped the requirement that the faithful should kneel during the consecration. Priests are considered mostly “sacrament deliverers”, while the entire Church is in the hands of the laity. The agenda is mostly focused on social issues, and is very scantly on doctrine. 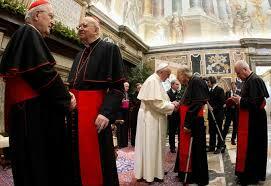 No wonder that the Archbishop of Wellington joined Cardinal Walter Kasper’s side at the synod of bishops. In the end he even admitted that New Zealand had already adopted the direction proposed by Kasper. Dew did not state this out of opportunism; he insisted out of personal conviction that Kasper’s proposals were right. On the other side of the ocean, beyond the surprise of a Cardinal hailing from Paranà, Pope Francis will create the Archbishop of Montevideo (Uruguay), Daniel Fernando Sturla, a Cardinal. He comes from the most atheistic country in South America, and he probably thinks that the antidote to the hemorrhage of the faithful is for the Church to move closer toward their positions: some of his declaration have been read as a real change of pace, especially for what concern doctrinal stances. What a pity, then, that a Pew Forum survey suggests instead that this approach may not be helpful. In a survey on reasons why Catholics leave to join Protestant sects, the Pew Forum established as the first three reasons the search for a personal connection with God, participation in a particular style of worship and, finally, a felt need for a greater emphasis on morality. This latter reason provides interesting data, as interesting as the data suggesting that evangelicals strongly defend family and life issues and reject gender ideology at the same time that the Catholic Church in South America shows itself to be weak on ethical issues. The loss of Latin America’s faithful seems to be endemic. Pope Francis’ Argentina merited treatment as a case history in the Van Thuan Observatory’s 2012 Report on Social Teaching in the World as the country that more than any other has been subjected to the colonization of human nature carried out by international lobbies. Brazil was devastated by the debate over liberation theology that even caused a split between the Boff brothers. While Leonardo Boff continues to celebrate para-religious rites although he quit the priesthood and lives with female partner, his brother, Clodovis, has come around to understand that putting the poor, and not Christ, at the center of the Church’s preaching has turned the Church in Brazil into a sort of merciful NGO. This is exactly what Pope Francis says he does not want. Yet the Pope seemingly prefers bishops with this kind of orientation, bishops who perhaps possess a very strong pastoral sensitivity, but one that is little supported by Catholic teachings. Pope Francis’ choices concretize the bias found in some ecclesial peripheries that view Rome as an obstacle and an impedment to their development. This feeling against Rome is not shared by peripheries of the Church in Africa and eastern Europe. The Synod of Bishops was a bench test for them. In eastern Europe, the bishops carry forward a difficult but true ecumenism, and their impact on society is strong. In Africa, they fight to preserve their identity against multinational companies and international powers that impose a secularist agenda in exchange for humanitarian aid. None of these peripheries has been rewarded with a new Cardinal. Instead during the Synod of Bishops Cardinal Walter Kasper, in an interview he reportedly thought was off-the-record, said that the problems of the Africans should not concern us. Thus arises the notion that there are peripheries worthy of concern and others that are not. Notice that an initial clue to this mindset comes from Cardinal Kasper, i.e., from a German, coming from a Church with a long tradition, but one that is strongly anti-Roman and sometimes influenced by Protestantism. It is noteworthy that Cardinal Reinhard Marx, Archbishop of Munich-Freising, a prime engineer of Vatican reforms and one of the main players in this season of the Church, has recently insisted that the Church should learn from Luther. Looked at from this point of view, it seems that the Pope’s favorite peripheries are those that perceive any central institution with suspicion and that seek a pastoral autonomy unbound from the doctrine of the Church. Step by step, the final outcome may involve the dismantling of the Roman Curia’s structures, and even the dismantling of the weight of some bishops’ posts. The Pope does not respect traditional balances, he simply de-legitimizes and undermines existing church institutions this way . Pope Francis’ plan does not seem to be long term. Reasoning in the short term he sees the need for Cardinals from peripheries who are able to carry forward his reforms and even quietly drive the Synod of Bishops toward his wished-for change in direction. The secret battle for the next Synod has already begun, as has the battle for advancing curial reforms. But if the Pope does not have a long term plan in mind, is there anyone out there who does? According the Austen Ivereigh’s book “The Great Reformer,” the team of Cardinals who backed Jorge Mario Bergoglio’s election convinced skeptical Cardinals to support him by arguing that Benedict XVI’s resignation established the principle that from now on a pope could leave office at the right time. These Cardinals certainly had in mind a plan for the Church. All of the Cardinals in the alleged ‘team Bergoglio’ are promoters of a progressivist agenda, one that favors a less doctrinal and more pastoral Church, an agenda of mercy that could not care less about justice. All of these Cardinals knew that Bergoglio, filled with the Latin American periphery’s anti-Roman sentiment, would back the reforms they hoped to see enacted. Nevertheless, they probably already have someone in mind for the next conclave. A very strong pretender to the throne may be Cardinal Luis Antonio Tagle, Filipino, young, esteemed in progressivist circles for his contribution to the “History of the Second Vatican Council”, an account of the Council drafted by the group of scholars belonging to the so-called ‘Bologna School’ who interpret it as a rupture, and not as a continuity, in the Church’s tradition. Cardinal Tagle, who would be the first Asian Pope (thus initially providing good media impact), is young and is viewed sympathetically by many. While he is committed to hyper-orthodox struggles (for example, against the abortion bill in the Philippines), he is also considered one of those bishops who may be more flexible in managing the Church, who would back a certain progressive agenda and accept advice. Some of the Vatican’s most attentive insiders note that Cardinal Tagle is never over-exposed to the media spotlight. But his ascent seems unavoidable: He seems to be among the most favored to take over the presidency of Caritas Internationalis in February when Cardinal Oscar Andrès Maradiaga, coordinator of the Council of Cardinals, ends his second term. The other future contender for the papacy is Cardinal Pietro Parolin, the Secretary of State. He worked hard demonstrating the full weight of the Secretariat of State, which was originally supposed to be dismantled or at least divided into two large secretariats. With diplomatic finesse, Cardinal Parolin has earned a prominent position, and he is now moving the Vatican’s diplomatic apparatus toward a limited global interventionism (he recently stressed that “there are so many conflicts that we cannot stay silent”), while still maintaining a certain realpolitik. If he wins the battle over curial reform, he may have a chance. It is indelicate to speak about the next Conclave while any pope is reigning. However, the current circulation of rumors signals that maneuvers over the next papacy have already begun. If the secret war over the synod and curial reforms can be said to be the most immediate issue on people’s minds, there is nevertheless a longer-term war they are also thinking about. For his part, Pope Francis does not seem to be a part of this war; he is mostly a pawn in it. But his unpredictability together with his impulsivity and improvisation constitute real contributions to the war effort. In the end, everybody knew which were the peripheries the Pope loved the most. And everybody knew about his resentment toward Rome and central church structures. Many of his latest choices prove it. 12 Responses to Pope Francis: Which Peripheries? This is a superb analysis deserving of the highest praise! These words are disappointing and demoralizing to many of us in the Church, but it is time to come to grips with the reality confronting us. “Anyone who has ears to hear should listen!” Thank you again for this work. This is a bit depressing for monday morning. I will have to go and read John Allen’s pre-conclave profile of “basically conservative” Cd. Bergoglio for a few giggles. Pope Francis and Team Bergoglio are breaking previous unwritten agreements and equilibriums. For instance Team Bergoglio’s members along with Cd. Tagle, Archbishop Forte, etc…, were all promoted either by JP2 or B16. And in the previous pontificates (very) liberal cardinals and bishops were never (or rarely) deposed, demoted, replaced, passed-over for promotion, publically criticized or given coadjutors. The only “positive” points in all this (if there are any), is that they are going too far. There is bound to be a reaction in the next conclave. Also, by its policy of not promoting conservatives and traditionalists, Bergoglio is inadvertently concentrating the opposition vote in very few candidates which will improve their chances of election or at least give them more bargaining power in the choice of a consensual Pope. But Pope Francis is 78. He will probably last to 85. Next conclave, this, not for 7 years. He will have transformed the body of Cardinals substantially by that point. We are in a really tough situation. The Church we know may be unrecognizable by that point. My wife is not Catholic and she has been a student of scripture her entire life. I say this because in reading this article I was reminded of what she said to me a few years ago, although I cannot remember in what context: “The whole catholic church will collapse.” Reading this, she may be right, although I prefer the words of scripture; “The gates of hell shall not prevail against her.” Hope? One small point. The link you provide with the sentence “The last liturgical reform there dropped the requirement that the faithful should kneel during the consecration” contradicts your sentence. According to the link, the Bishops of NZ WANT kneeling during the Consecration. The universal GIRM, like its predecessor, calls for standing during the Eucharistic Prayer EXCEPT for during the Consecration, when we are to kneel. This is what the Bishops want to restore. In other words they want to reverse some of the damage done by liturgists. Richardson above is incorrect unless he/she can provide evidence to the contrary. Kneeling during the consecration was even ordered forbidden in NZ’s only seminary. If this has been changed Richardson needs to produce evidence. There is a prophecy concerning the last pope, who will be elected rapidly due to a world wide disaster. Many electors will not be able to come, and or have died. So goes the plans of men. They can try, but it will not work for them. One other point, a great novel at the turn of the previous century said the deception will come that will propose a church that sounds and feels like the church, but will emphasize social doctrine, feed the poor, etc… Just as Judas did when he said the money could be used to feed the poor. The one thing missing from this new church will be Jesus Christ. It’s beginning sound familiar. I gather there are any number of prophesies about, any of which might be interpreted for the “benefit” of the interpreter. If you’re concerned that the Church under Pope Francis has abandoned Jesus Christ, keep in mind that many people thought similar thoughts during the later Middle Ages. Popes acting naievely or sinfully are nothing new to the Church’s history. I’m not great fan of Pope Franics myself, but if the situation is beginning to sound familiar, it’s because Holy Mother Church has weathered many trials. Let’s not make Pope Francis’ papacy into any more a disaster than needed. “In Africa, they fight to preserve their identity against multinational companies and international powers that impose a secularist agenda in exchange for humanitarian aid. Does Ethiopia not count as part of the African periphery? What about Cape Verde? Since when did it become “hyper-orthodox” merely to oppose legalised procured abortions? The article is full of presumptive theorizing about trends that probably will not make one iota of difference because the core problem of the Universal Church is that it is controlled, not by the faithful, but by powerful invasive forces created by the Illuminati. The Illuminati, in its various and often obscure manifestations, is in control and heavily involved with pomp and ceremony. Most dedicated Christians who adhere to the 10 Commandments, no matter which denomination they belong to, insist on a personal relationship with Christ instead of a Church Organization that calls the tune with irrelevant requirements. Hence one will find that there are more genuine Christians on the periphery of churches than inside it. Anyway, no one needs to expose their Christianity to others , it is none of any one’s business. When Church Organizations require visible piety and congregation as a prerequisite for acceptance into a fold, then those churches are no better than the Islam that requires their adherents to perform all kinds of illogical kowtowing that bears no relationship to morality but is entirely created for the sake of the power structure and those who rule it.